Holton High School’s FFA chapter is developing a community beautification program, and the Holton City Commission has given the chapter its blessing to clean up the city’s parks. During the commission’s regular meeting on Monday, six members of the FFA chapter and their advisor, Jason Larison, gave commissioners information about their “Adopt-A-Spot” service project, which aims to promote community and civic engagement by encouraging volunteers to join them in cleaning up local parks and other community sites. 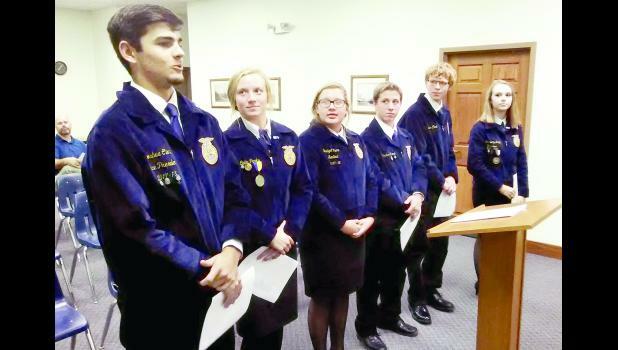 Commissioners were receptive to the chapter’s plan, which Larison said was similar to the Kansas Department of Transportation’s “Adopt-A-Highway” program and inspired by discussions that chapter officers had at a recent FFA retreat.